When will I get my bike? If you're within our 48 continuous states, you get free shipping! After we send it out, shipping typically takes 3 to 5 days to brighten up your doorstep. Do you ever sell discounted or previously loved bikes? Absolutely not. We want to make sure we maintain the properly quality and care of each newly built CYCLE Kids bike, your bike will always be brand new. Our WeCycle efforts embrace these ideals. How easy is the set-up assembly? It's super easy! 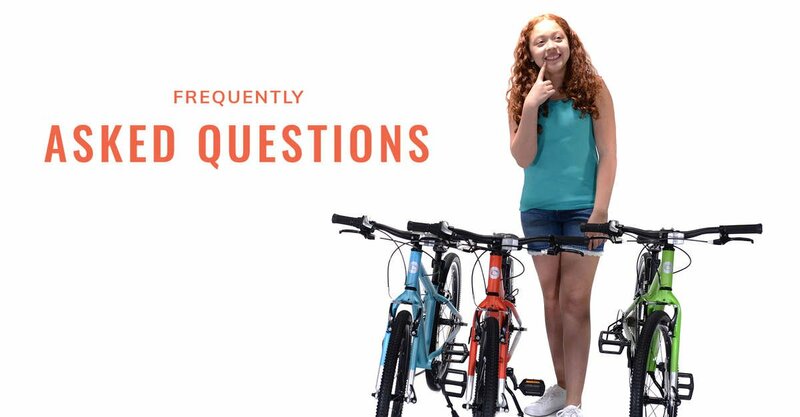 Your CYCLE Kids bike will always arrive at your door partially assembled, making set up and assembly a breeze - in 15 minutes or less. you're still struggling, our Set-Up Video will have you finished in no time. Here's a happy chart to help familiarize yourself. Who covers shipping for returns or exchanges? in the USA. If you'd like to return or exchange your bike, we always cover the cost of shipping in the even that the bike is still in peak condition. Help! I've got a technical problem, who do I contact? will get you back on your ride, in no time at all.